… my hubby planned something for me and I wanted to give something back, at least a little card 🙂 So I grabbed the new MFT Ewe are the best stamp and the stitched cloud edges to create a Valentines Day card in “seventh heaven” (Do you know this saying or is that a German thing?). I started with die-cutting the background and blended distress ink (Mermaid Lagoon and Salty Ocean) to create the sky. Nothing fancy, just simple blending without water. Now I took some white card stock and vellum, ran it through my die-cut machine with a stitched rectangle first and with the cloudy borders afterwards. I tried to use the bigger clouds for the vellum, because they are in the background, and the smaller clouds for the white card stock. Next I stamped the sheep with the heart (it’s soooo cute 🙂 ) and colored it with Copics. For the shadow I used C0 and C2 and tried to keep everything very light. The heart was colored with my favorite red combo R21, R14, and R27. After I was done coloring the heart, I thought that it looks like a balloon, so I had to add two more heart balloons that fly into the air. I used the one from the Ellie set from Avery Elle and colored them with the same red combo. Now it was time to assemble everything. I adhered the white cloud onto the vellum clouds using foam tape. Now I had some coverage for the liquid glue on the back of the vellum and adhered that to the background. I added a little Lawn Fawn red sparkle twine to the balloons and popped them up with foam tape. After I was done, I realized that I forgot a sentiment… Dang… Thankfully the cloud at the bottom had a lot foam tape behind it, so I was able to stamp a clear sentiment. Phew! As a final touch, I added some Spectrum Noir sparkle to the balloons. Btw, this pen has more sparkle in it than the Wink of Stella, but besides that it’s exactly the same. I hope that you have an amazing Valentines Day and enjoy the time with your loved ones, no matter who it is! I uploaded this card for the Friday Mashup Challenge FM 242 and the Cupcake Inspirations Challenge 347. Avery Elle, glitter, MFT Stamps, Valentines Day. Bookmark. Super cute card and I like all the layers that added the dimension. Thank you for joining us over at Friday Mashup!! I am sure your hubby loved this! It is so adorable! 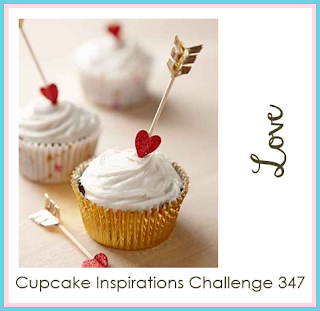 So glad you were inspired to join our Love theme challenge at Cupcake Inspirations. So sweet of you to make this card for your hubby! I love the scene you created, perfect for that adorable sheep in the seventh heaven. Thank you so much for linking up and playing with us at the Friday Mashup! Your sweet sheep card has me smiling allll over my face! I know your husband adored it, as do I! Thank you for sharing this love-inspired gem in the Cupcake Inspirations gallery!